New Year’s Resolution to ski more! I doubt most parents kick off the New Year resolving to “spend more time puttering around the house doing mundane chores.” And kids don’t pledge to spend 48-hours playing Wii or facebooking. But that’s what families end up doing most winter weekends. Why not resolve to spend just a few hours each weekend outside with your kids? What’s so hard about that? Whether its ice skating, sledding, or skiing, make a pact with your pack to get out and play in the snow this winter. What’s nice about this resolution is that it has the side benefit of “getting in shape”, or “loosing weight” – which ties in with many people’s customary New Year’s resolutions. If your kids are really little (2-4), find a backyard slope and create a nice gentle sledding hill. We did this when ours’ were tots, and found that after a few descents on the sled – our snowy yard turned into a well groomed learn to ski run. With basic ski equipment (skis and boots), we were able to get our kids making first tracks in the (free) comforts of our front yard. Sure, it was a bit of manpower pulling our kids around our miniature private ski slope. But it’s great exercise for the adults and a great intro for the kids, close to home and on budget. Once you start your kids skiing, head to your local ski hill. More resorts have added Magic Carpets to their bunny slopes. Like the airports’ moving walkways, these lifts are brilliant for beginners and for young parents that tire of hauling their kids up the ski slopes. And many resorts offer a learning area ticket – so you don’t have to pay for the whole mountain. There are plenty more deals on downhill skiing, resorts are rolling out discounts everyday. So make sure you uphold your resolution, and get out and play with your kids in the snow this month. 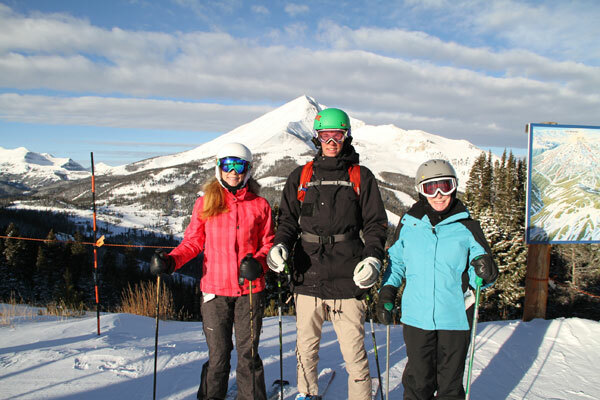 Family skiing also cures January sunlight deprivation and cabin fever.